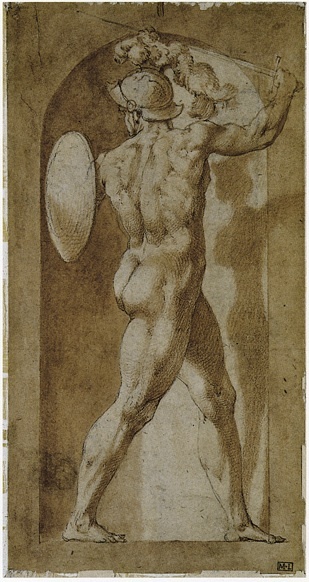 Red and black chalks, 18.6 x 13.2; the upper left corner missing; the lower right corner torn; laid down; the drawing is very dirty and badly rubbed; a few of the black chalk lines along the torso, back, and buttock may have been gone over, but elsewhere all done in black chalk is original and is not re-worked. Inscribed in ink in the lower right corner: Rous F … f.
PROVENANCE: E. Gatteaux (Lugt 852). Given to the Louvre in 1873, as Rosso. Kusenberg, 1931, 137, 146, no. 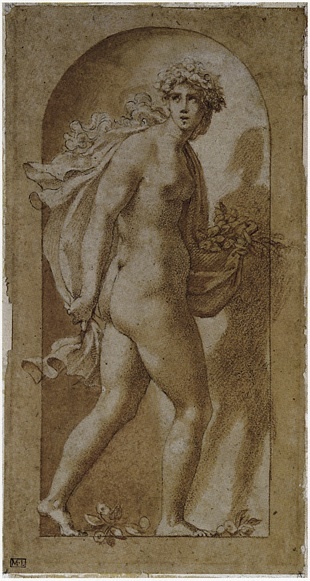 75, as Rosso, with some lines gone over, and as engraved by Boyvin, but the print he mentions (Robert-Dumesnil, VIII, 1850, 21, 10) is not the one related to the Louvre drawing. Levron, 1941, 74, under no. 166, as Rosso, and, repeating Kusenberg, as engraved by Boyvin. Barocchi, 1950, 216, n. 2, Fig. 195, as a copy after Rosso, perhaps from a print by Boyvin. Carroll, 1964 (1976), I, Bk. I, 226-228, II, Bk. II, 356-359, Bk. III, Fig. 100, as possibly a copy of a drawing datable around 1532-33; “Addition to the Preface,” 1976, vii, as autograph. Carroll, 1987, 9, 37, 42, 192-193, no. 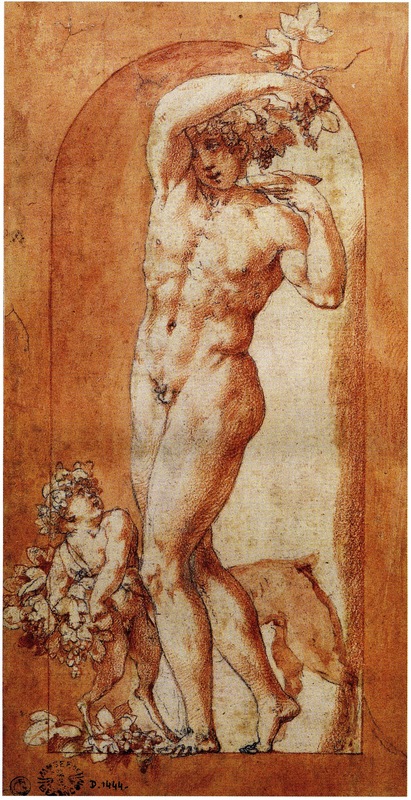 63, with Color Pl., as Rosso, 1531-1532, with the suggestion that it was made as the model for a print. Franklin, 1988, 326, under no. 54, mentioned the complex interplay between the black and red chalks. Miller, 1992, 111, commented on the appealing use of red and black chalks. Costamagna, 1994, 53, 96, n. 49, 147 and n. 2, under Cat. 31, 293-294, under A52, as Rosso, as slightly later than his Macabre Allegory of 1517, and as opening the way for Pontormo to paint his St. Anthony Abbot of 1519-1524; its landscape copied in the St. Jerome formerly in the Guicciardini Collection wrongly attributed to Pontormo and Rosso. 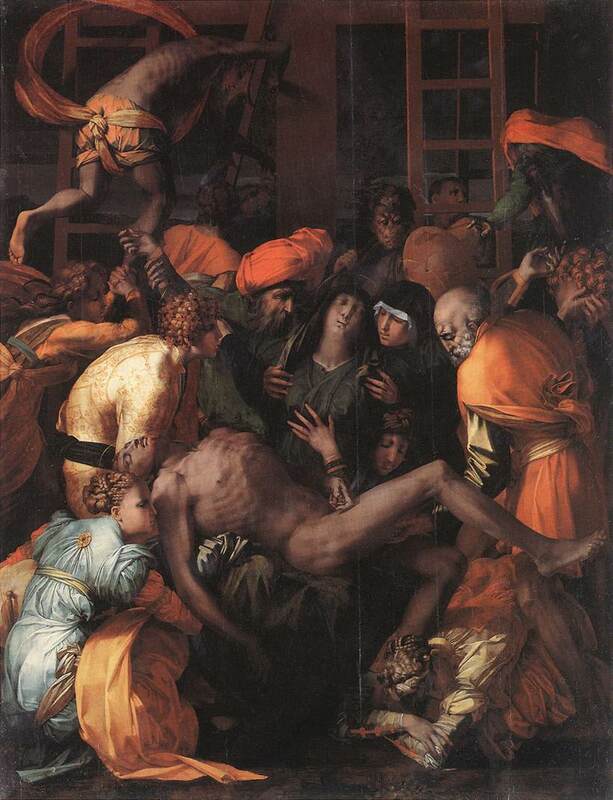 The body of St. Jerome in this drawing, both its bony and muscular appearance as well as its extended posture, is very similar to Christ’s in Rosso’s Pietà in Borgo Sansepolcro (Fig.P.19a), and in his painting of the same subject in the Louvre (Fig.P.23a). St. Jerome’s head is quite like that of the Standing Apostle of 1529 in the British Museum (Fig.D.36a) and that of the old man doffing his cap in the copy in the Louvre of a lost drawing (Fig.D.50Ca) for the first version of the Sacrifice in the Gallery of Francis I. 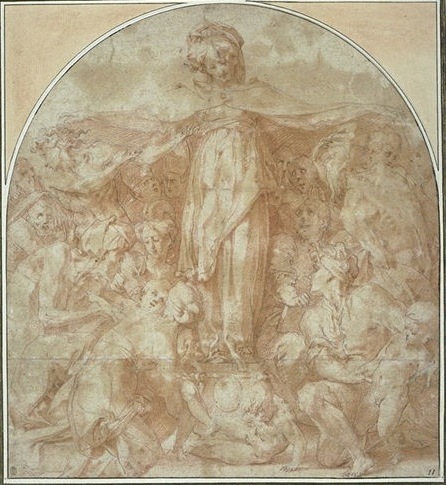 The softly knotted and folded drapery in the drawing is similar to that in the lower left corner of the Madonna della Misericordia of 1529 (Fig.D.35a). 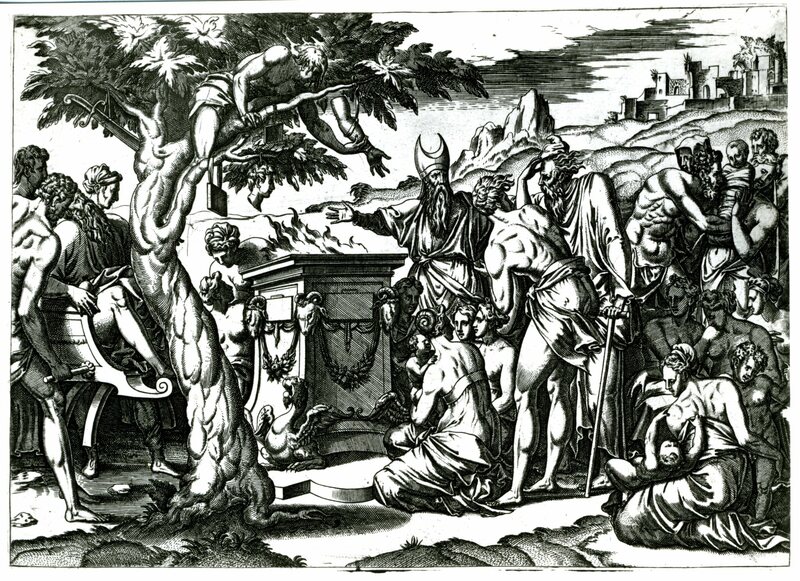 Compositionally, the St. Jerome, with its forms so arranged that they appear pressed into a narrow area of space in the foreground of the scene, is similar to the Pietà in Borgo Sansepolcro, the Pietà in the Louvre, and the Pandora and Her Box in the Ensba in Paris (Fig.D.67a). 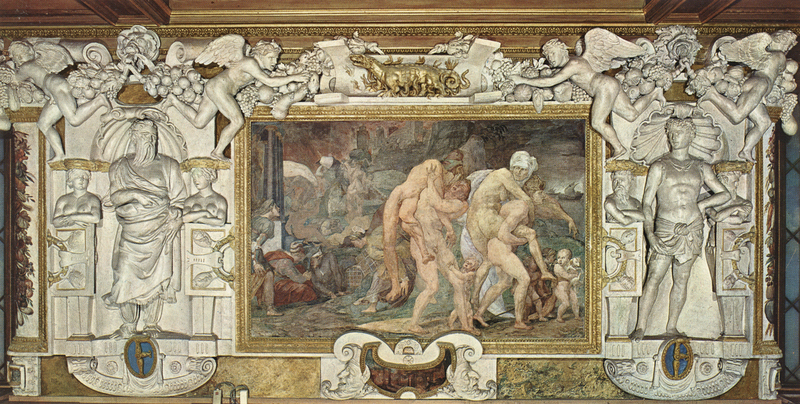 In the drawing, the amount of space and the few details of the landscape can be compared with those in Rosso’s Twins of Catania in the Gallery of Francis I (Fig.P.22, V N a). 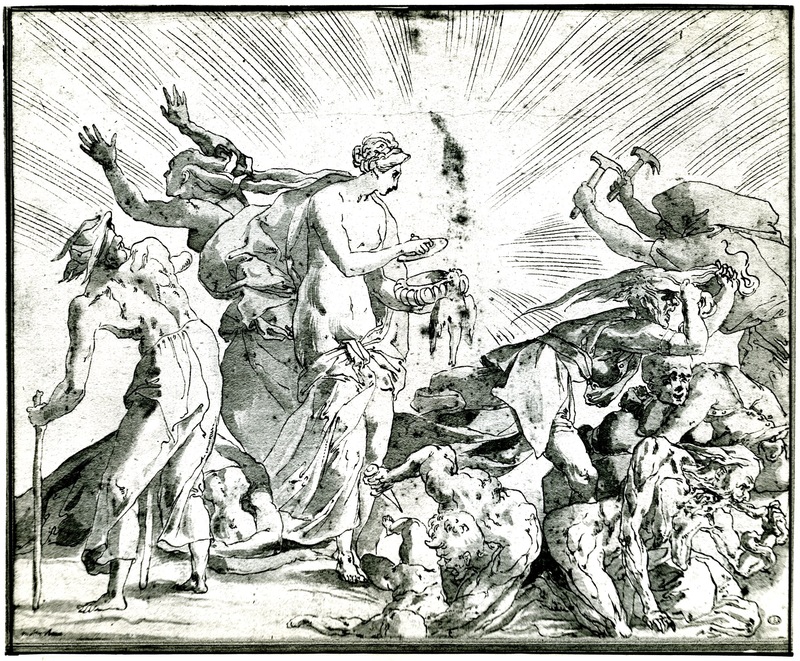 Considering the variety of ways that the St. Jerome drawing is stylistically related to works by Rosso, it appears quite clear that the design of this drawing is his. 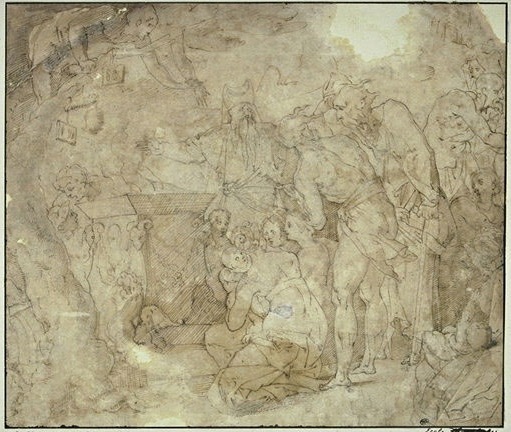 The dryly rendered contours and shading in the drawing are found in Rosso’s Madonna della Misericordia, and St. Jerome’s left leg and foot are drawn quite specifically like the leg and foot of the male figure in the lower right corner of that drawing. 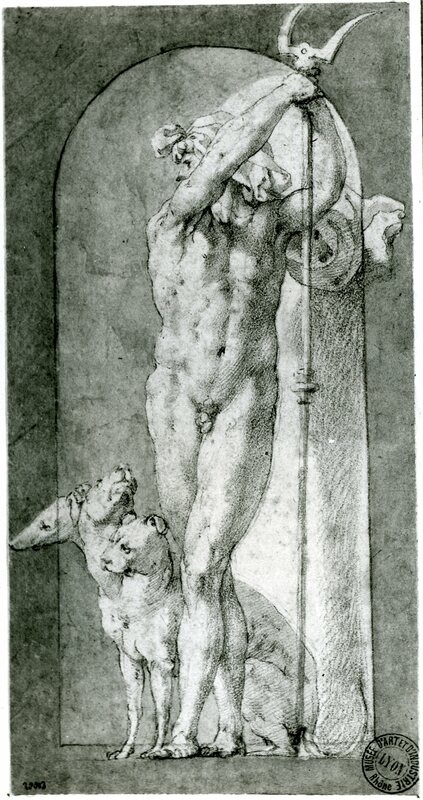 But the draughtsmanship of the St. Jerome appears very granular and in this respect resembles the handling of Rosso’s Pluto in a Niche (Fig.D.17A), Bacchus in a Niche (Fig.D.18a), and the other known disegni di stampe for the Gods in Niches made in Rome in 1526 (Fig.D.17B; Fig.D.17C). However, something of this texture in the Louvre drawing is probably due to its having been badly rubbed. 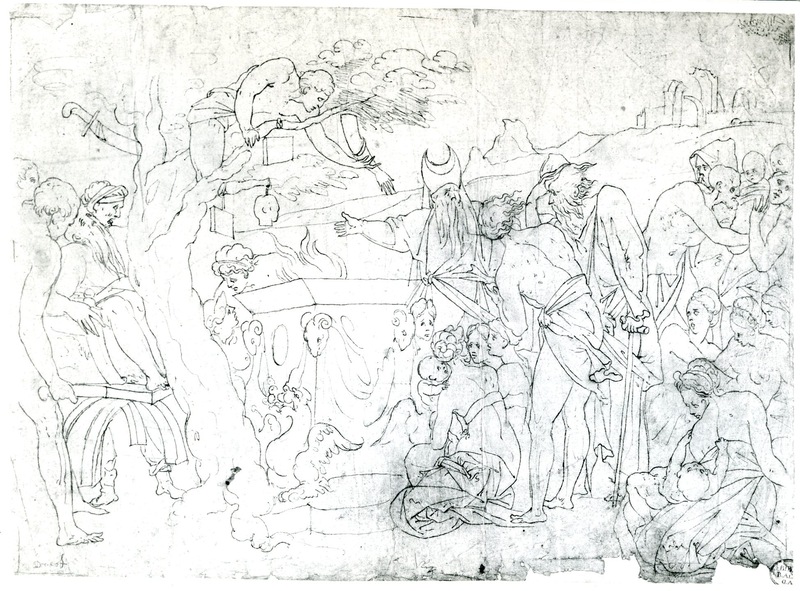 Although the condition of the drawing gives it a rather dull appearance, close inspection indicates that it is an autograph work even if a few black chalk lines on the outer edges of the saint’s body in shadow may have been gone over by a later hand. 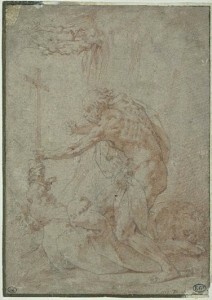 Because of the similarity of the saint’s pose to the poses of the figures in Rosso’s first version of the Sacrifice in the Gallery of Francis I (see Fig.D.50A; Fig.D.51; and Fig.E.50), it is likely that the St. Jerome is an early French drawing by Rosso. But the drawing lacks the drama of the first Sacrifice composition, suggesting an even earlier moment before the artist became involved with the decorations at Fontainebleau. 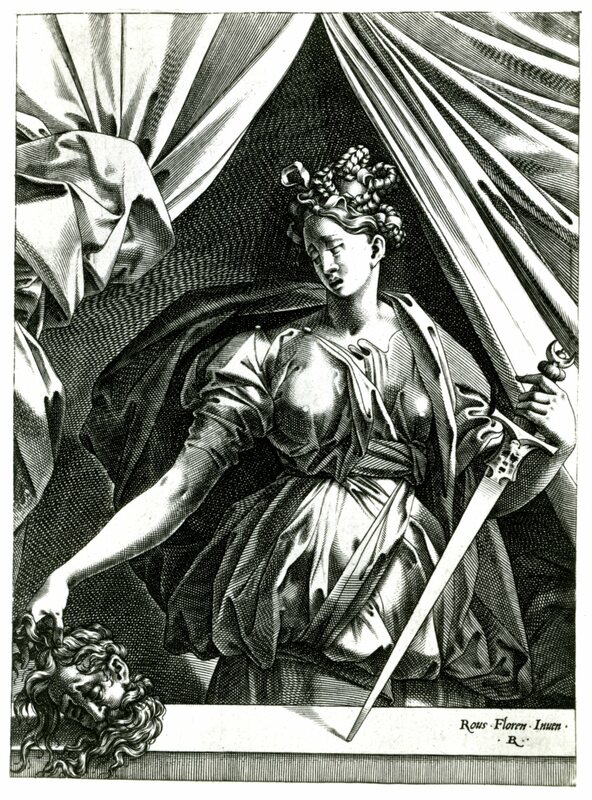 It may, however, have been executed after the very elegant Judith, done, it would seem, in 1530-1531, and known from an engraving by Boyvin (Fig.E.7). 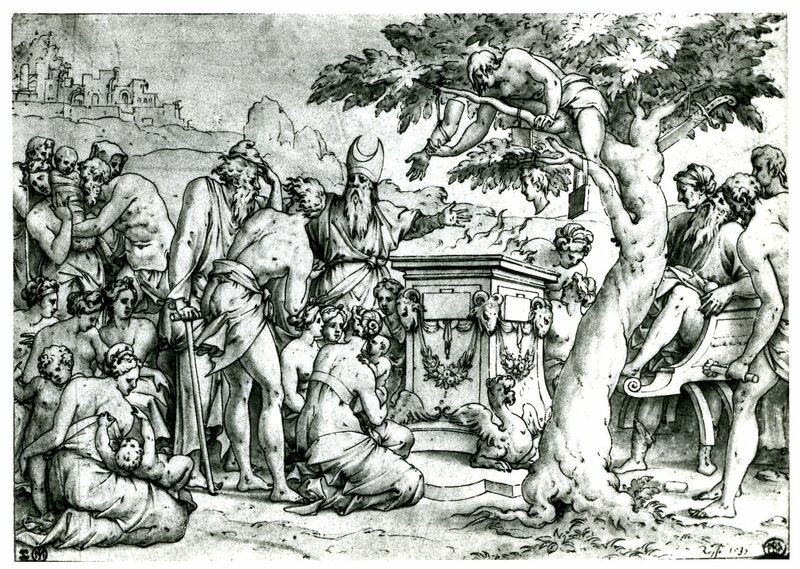 It is possible that the St. Jerome was executed around 1531-1532, although this indicates a relative position for the drawing and not a dating that is secured by firmly dated early French works. 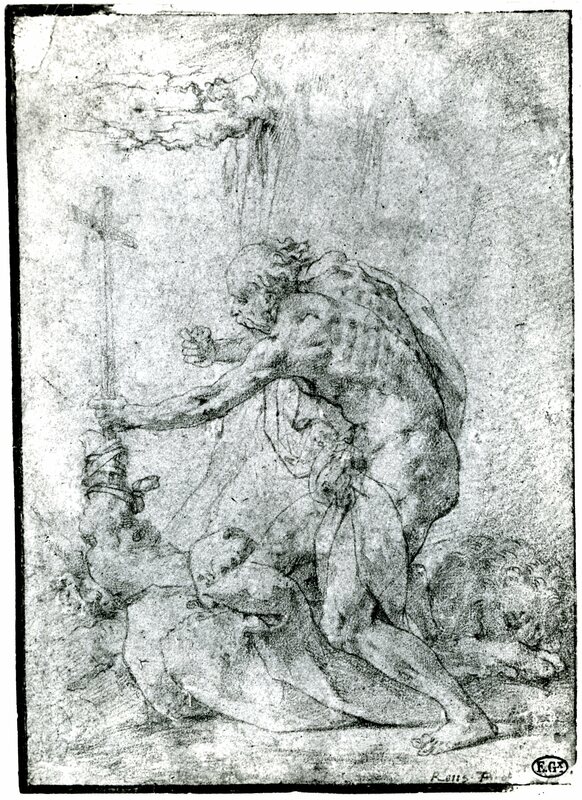 I do not see any relation of this drawing to Pontormo’s wholly differently conceived St. Anthony Abbot that Costamagna seems to recognize, nor do I see any specific connection between the landscape in the drawing and that in the Guicciardini St. Jerome. 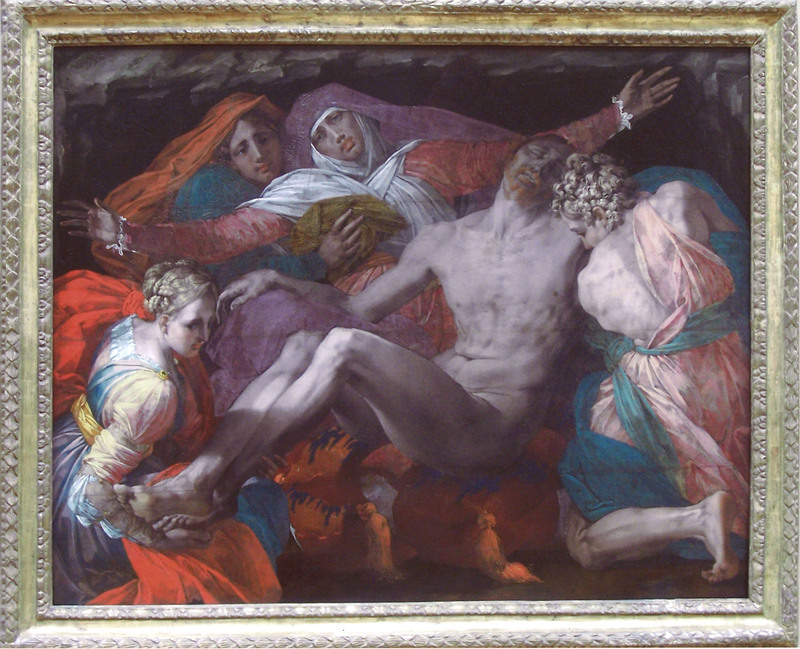 Within Rosso’s own oeuvre, the drawing looks significantly later than Pontormo’s painting.